Sign-up using the form or call us at 940-566-3232 to take advantage of this exclusive offer. Almost half of all children will suffer from at least one middle ear infection (otitis media) before they're a year old, and two-thirds of them will have had at least one episode by age three. The symptoms of otits media include ear pain, fever, and irritability. If you look into the ear of a child who has otitis media, you will be able to see a buildup of fluid behind the ear drum, and the inside of the ear will appear inflamed. Otitis media is caused by either a bacterial or viral infection and frequently results from another illness such as a cold. For many children, it can become a chronic problem, requiring treatment year after year, and putting the child at risk of permanent hearing damage and associated speech and developmental problems. 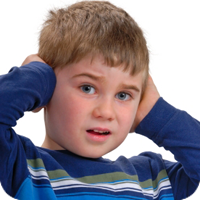 In either case, the underlying root cause of otitis media is usually a mechanical problem. There is either a reduced or blocked drainage of the lymph vessels in the neck lymphatic chains that causes a build up of fluid in the inner ear, or a loss of normal function of the small muscle at the opening of the eustacean tube in the throat that allows bacteria and viruses from the mouth to enter the inner ear. Instead of treatment that tries to kill the bacteria or virus, a more natural approach would be to restore normal drainage of the ears and neck lymphatics. This is most effectively done through chiropractic.